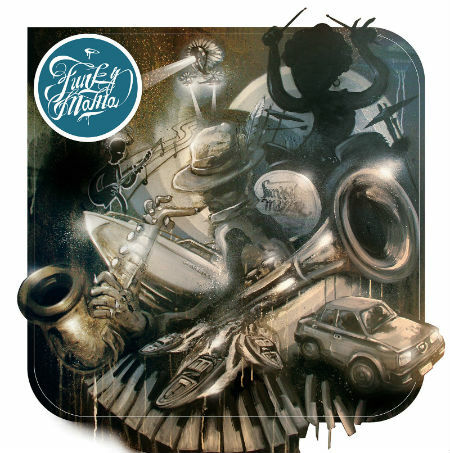 New Italian afro-funk outfit Funky Mama exploded onto the scene in September with single “Ottobre: fuga dalla stazione centrale”, which caught the attention of stations worldwide with airplay that went from Spanish national station RTVE to Sydney’s much respected 2SER or John Warr‘s cult radio show “Afrobase” on Juice fm Brighton. Now the band is ready to reveal it’s debut self-titled EP out on limited edition vinyl + CD and digital download. “Funky Mama EP” contains 4 original instrumental tracks of explosive afrobeat-inspired grooves served with the typical warmth and rawness that characterizes Southern Italy, where the band members are all originally from. With a badass horn section accompanied by a super heavy array of percussion, bass and soulful organ/synths, this release is sure to put Funky Mama firmly on the map as one of the most interesting up and coming groups of the developing Italian funk scene. From the uptempo afro-jazz vibes of “Evolution n.1″ to the blaxploitation atmospheres of “Pirro’s Shower”, funk stormer “Ottobre: fuga dalla stazione centrale” or the surprise break of jazz-funk closer “You Can Dance”, this EP is a sizzling blend of infectious afro-funk rhythms imbued with a jazz-dance flavor that can only be described in one way: hot! The album artwork is curated by Internationally renowned Italian artist Mr. Wany, who also appears in the VIDEO to single “Ottobre: fuga dalla stazione centrale” launched in the Fall to anticipate the release of the EP.